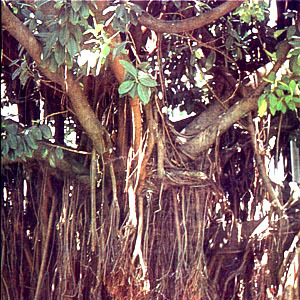 Balete – Scientific name: Ficus stipulosa Miq. Linn. Glabrous spreading tree, up to 8 meters high, with numerous adventitious roots from the trunk and branches. Leaves are smooth, leathery and shiny, slenderly acuminate and entire. The stipules are red, as long as the leaves. Skin eruptions and dermatitis: Boil one cup of chopped bark in 1/2 gallon of water for 10 mins; use decoction to wash involved areas, twice daily. This entry was posted in List of Medicinal Plants in the Philippines and tagged balete on March 9, 2009 by Pinoy Herbs.